The City of Madrid (Spain) Madrid is the capital of Spain and is located in the center of the Iberian Peninsula. It has a population of 3,000,000 inhabitants, together with the suburbs, the figure rises to 6,000,000. The city is a major financial and business center, with a significant amount of corporate head offices. 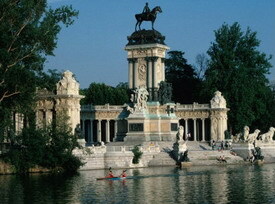 Madrid's climate is continental with cold winters (temperatures below 0 º and heavy frost) and hot summers. In its gastronomy include corns, the stew, churros, squid (in sandwiches or rations), potato tortilla, patatas bravas and the typical wines of the region. Buy at AllPosters.com Barajas airport is located next to the highway A-2 Barcelona, a distance of 15 kilometers. It has 4 terminals T1, T2, T3 and T4, which was the last one opened. It is accessible from the airport to the capital through the Metro Line 8 (Nuevos Ministerios-Airport T4). In the sports section, Madrid has two large football stadiums. These are the Santiago Bernabeu stadium and Vicente Calderon, where local teams play as both Real Madrid and Atletico de Madrid respectively. Both stadiums are rated 5 stars granted by UEFA. Special mention are the San Isidro festival between 8 and 15 May and the feast of Our Lady of Almudena November 9, official patron of the Villa. Among its museums, monuments and sites of interest include: -The Royal Palace in Madrid. Opened by King Carlos III is located on Calle Bailen. Its neoclassical style and is considered one of the finest palaces in Europe. It has excellent facilities among which stand out, the Jardines de Sabatini, Annexes, Campo del Moro and the Throne Room. -La Calle Gran Via is one of the main streets of Madrid, with heavy traffic, especially on weekdays. It begins in Alcala Street and ends at the Plaza of Spain. Half of street you can find the Plaza de Callao, referring to when making purchases of any kind. "Puerta de Toledo: La Puerta de Toledo is located in the Plaza of the same name. Inaugurated in 1827, was initiated in order of Jose Bonaparte. -The Museo del Prado: Neoclassical palace of Juan de Villanueva located on the Paseo del Prado. Its construction was completed during the reign of Ferdinand VII. Exhibition of the Flemish school are El Greco, Titian and Murillo. -Parque Juan Carlos I: Parque Juan Carlos I is located just off Highway M-40, in the neighborhood of Hortaleza. It was opened in 1992, transforming the old Olivar de Hinojares, in a magnificent park. Inside we find a large lake, trees and fountains. About the Author - Reservas-hoteles.net and Fotoviaje.net offer you this gallery of photos of Madrid and a wide variety of hotels in Madrid of all types: economic, family, chain hotels, airport hotels, independent, luxury hotels or boutique hotels.